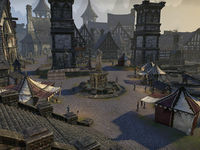 Wayrest Merchant District or Wayrest Market Square is a marketplace west of the river in Wayrest. Aizar's Helms and Hauberks — A heavy armor stall run by Aizar. Chop House Cleavers — A weapon stall run by Tulashurr. The Fletcher's Fist — A weapons stall run by Virdyn. Fog-Break Magicks and Arcana — A stall run by the mystic Dacele Elve. Gold Coast Wholesale Armor — A medium armor stall run by Barnabe Malyne. Market Square Mercantile — A general goods stall run by Lea Douer. Tin Needle Tailors — A light armor stall run by Yolande Farielle. This page was last modified on 19 November 2018, at 06:14.